Hiei was the second ship of the Kongo class, she was built at Yokosuka Arsenal with technology gained from the construction of the first ship, Kongo, the Vickers Yard in Great Britain. She was the first large Dreadnought type battle cruiser built in Japan, after refitting she was classed as a battleship. Due to the stipulations of the post WWI London Naval treaty she became a training ship, and in a Naval review she had the honor off serving as the personal vessel of His Imperial Majesty the Emperor Showa. After the expiration of the disarmament treaty, she was modified and used to test new technology for use in the Yamato class, she was famous for having a different appearance than her sisters in her class. In the Greater East Asian War (Pacific War) she was part of Admiral Nagumo’s Mobile Strike Force. On Showa 17 (1942) November 12th, in the 3rd battle of the Solomons, she was damaged in the night battle, the next she was sunk in an air attack. She became the first battleship to be lost in The Great Pacific war by the Imperial Navy. 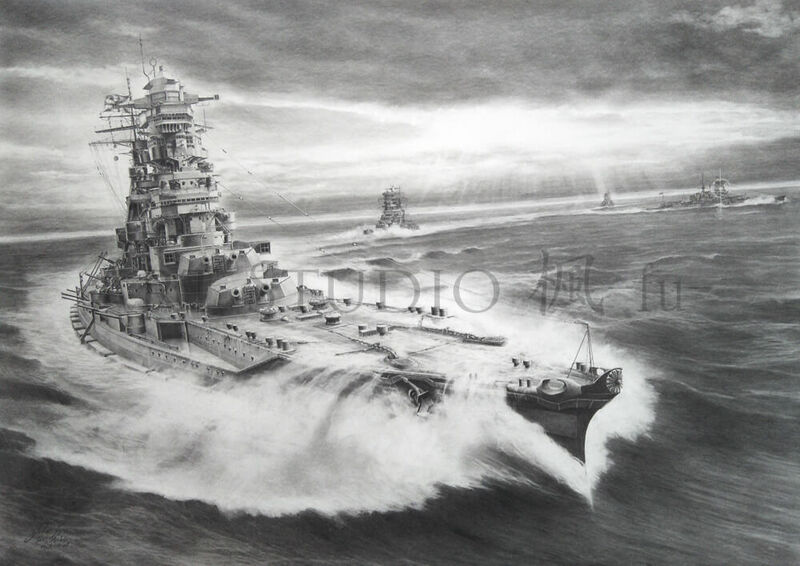 This drawing shows her as part of Admiral Nagumo’s attack on Sri Lanka, (then Ceylon) with the Mobile Strike Force. Passing Sumatra Island to the south, the four Kongo class ships are shown with island off to starboard, an unusual formation. In the drawing, drawn from the port side, Hiei and Kongo are leading double columns. After Hiei is the Kirishima. And the Haruna is following Kongo. Steaming abreast of each other, Kongo and Hiei are exchanging light signals.